The Labour Party is the only organisation in the country that can stop a Tory Brexit. Only Labour can win a vote in parliament to get a referendum on the Brexit deal with an option to remain – the only democratic solution to the Tories’ disastrous Brexit policy. Only Labour has the campaigning skills and numbers on the ground to speak to enough people. With those resources, the party has the power to convince the public that a Tory Brexit would be a disaster for our jobs, livelihoods, public services and workers’ rights – and that we should vote to keep the deal we already have with the EU. Labour Party conference 2018 will be remembered for being the point at which we nailed our colours to the mast on Brexit. Over the summer, we submitted over 150 motions to party conference calling for a public vote on the deal. Most of these motions were worded to demonstrate support for the Labour Party leadership and opposition to Tory Brexit – making clear that this the position held by the vast majority of Labour members. We succeeded in shifting Labour policy. But now is not the time to slow down: we have just six months to stop a Tory Brexit. To get and win a final say we must do two things – win a vote in parliament, and win the debate in the country. To win in parliament, it’s crucial that all Labour MPs vote against Theresa May’s deal and for a public vote. We’re working with the electorate to remind our MPs that most Labour voters want a public vote, even in seats that voted to leave in 2016. And to win over the country, we must speak to voters. Face-to-face conversation with people from our own communities is still the most effective form of political campaigning. Here’s what you can do to help over the next few months. 1. Join the campaign in your area. Tory Brexit is an attack on the rights, freedoms and livelihoods of working-class people and the communities that Labour represents. We are working across the country with CLPs, trade unions, Hope Not Hate and other organisations to take the message to the public: a Tory Brexit would harm them and their families. 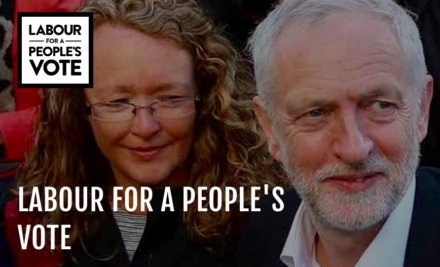 We need thousands of people to join us – speaking to voters, dropping off leaflets, running street stalls and speaking at events. To join us, sign up here, and to join the team as a CLP rep, click here. 2. Submit our CLP motion. We won a huge battle at Labour conference. Our policy is now to oppose Tory Brexit, to vote down the deal and to campaign for a general election or – failing that – a public vote on the deal. But we must go further still. Our new CLP motion calls for a manifesto commitment to a public vote if a general election is called, ensuring that the people would get a say on any Brexit outcome. It also affirms our support for the election of a radical Labour government. To download the motion, click here. 3. Target your trade union. Trade unions are key to stopping Tory Brexit. Together, the unions have over six million members. They also have a strong position on Labour’s NEC. If you’re a member of a trade union and can help to support and lobby your trade union leadership, click here. We’ll be in touch to tell you how you can help and how your union can help stop a Tory Brexit. Only MPs can vote for a referendum on the Brexit deal with an option to remain. To sign up to lobby your local Labour MP, click here. We’ll send you information that you can use to speak to your MP or a neighbouring MP. 5. Got other ideas? Share them with us. Can you help us in other ways – by volunteering your time, your skills or your professional expertise? If yes, let us know here – we’d love to have you on board. As we expand our campaign across the nation over the autumn, we need to hire more staff, print more leaflets, do more on social media, and do more to influence MPs and trade unions. Every donation – however small – makes a huge difference. If you can help out, click here: you’ll be making a big difference in the fight to stop Tory Brexit.